We’re all aware of the metal crowns of the past and how they were the standard for tooth restoration and replacement for decades. Nowadays, people are more concerned about the materials they put inside their body, and this includes dental materials. When you visit Dr. Twohig’s office to restore a tooth or replace teeth via a dental bridge, you can rest knowing that our materials are all-ceramic and incredibly durable. To get your smile restored, don’t hesitate to contact our office and schedule an appointment! Overall, crowns are used when a dental filling is unable to sufficiently restore a tooth. They are cared for much like natural teeth and can last for at least 10 years before needing any sort of replacement. Our crowns are custom-made to not only seal your vulnerable tooth from oral bacteria, but blend in seamlessly with the rest of your smile. 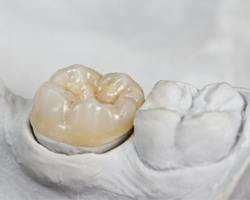 Dental bridges are the first option to consider when replacing teeth. After a tooth is extracted, neighboring teeth will quickly begin to shift into the open space as a way to compensate. 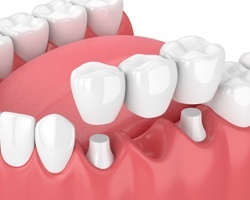 To prevent this, dental bridges can effectively fill that space with a crown on either side (both of which are anchored by altered neighboring teeth) and a series of false teeth that fill the gap, or pontics. Dental bridges are able to replace one to two teeth at a time and can also be retained with dental implants for a stronger foundation. On average, they last between 10 and 15 years when properly maintained. If you have a damaged tooth that is still functional, even though a dental filling is not enough to restore its fullest functionality, you’re more than likely eligible for a dental crown. Those who are missing teeth but still have remaining healthy teeth are likely able to receive a bridge. The best way to find out for sure is to visit our office for a more thorough examination. Upon completion, we’ll take impressions of your tooth and send them to a trusted dental lab offsite. In about two weeks, you’ll come back to our office to have the restorations fitted and modified if necessary.